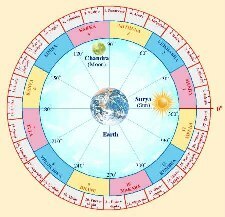 Shravana Nakshatra: Spread after 10: degree up to 23:20' in Makar. Lord Sani, symbol 3 footprints, deity Hari who takes all forms of Brahma , Vishnu, Siva, etc. It is the birth star of Saraswati. From this is derived light-rays, lion, beasts, horse etc. . "hari" means "to take away". From Sravana is derived the art of hearing and education and audible education. He is very melodious in his speech. He maintains neatness in every work he undertakes. There is a set principle for him in his life related to cleanliness. He expects his surroundings to be very clean and dislikes people who tend to be shabby or do not maintain a tidy atmosphere. Once he notices a person in untidy condition he will not hesitate to comment on the same. He is full of pity for others and tries to help others as far as possible. He likes to have clean and delicious food and is thus found to be a very good host. He is God fearing and is full of Guru bhakti (respect to the teacher). He is a believer of 'Satyameva Jayate' (Truth alone Triumphs). He should not expect any benefit or return from the ones he has helped out, it has rather been noticed that he is subject to deceit from others. Even if a thief is caught by him he will try to find out the truth of the circumstances which led that person to become a thief and if he is convinced he will let that fellow go. His inherent quality of bearing a peaceful appearance and the knack for dealing with others will penetrate the minds of the people he encounters with; hence he is the fittest politician for the modern times. One smile of the native can do wonders and attracts everybody towards him. Once his smile draws the attention people cannot forget him. Whatever may be the ups and downs in his life, neither will he reach to the top nor will he be at the bottom. In other words, a mediocre life will be enjoyed by him. Even illiterate born in this Nakshatra will show complete maturity and will be eager to gather knowledge whenever they get an opportunity. He is a very good adviser. Others will look up to him for solving individual as well as collective problems. He is a versatile genius. He has the ability and capacity to undertake different jobs at a single time. If he is crowned on a seat where some power and authority vests, he will shine well. He is always in search of an authoritative job. Since he has to shoulder many responsibilities he ends up spending a lot of money, therefore, he will always be in need of money. He is not revengeful even to his bitterest enemies. He will be content thinking, "Let God give them the due punishment". Good Explianation about this nakshatra. If you explain more about job oppurtunies and marraige time , it would be appreciated .